The average home buyer will be facing one of the largest purchases he or she will ever make. Lifestyle, wealth, and comfort are all on the line. With high stakes for clients and large demands on agents, there’s little room for missed messages or inefficient communication systems. We’ve rounded up four key communication obstacles that real estate agencies face. Whether you work as a buyer’s agent or a seller’s agent, these communication obstacles could make closing deals difficult. Have you experienced any of these phone fails in your business? In many small business phone systems, the included features are slim, and the expense of enterprise-level add-ons can be costly. So, you may make do with a barebones phone system because it’s “good enough.” However, it’s likely that your antiquated and inefficient voicemail system will cost you some sales due to missed messages and overall miscommunication. In contrast, the advanced voicemail system of Ooma Office can help you stay a step ahead. It’s easy to access voicemails remotely, but also, the system automatically emails the voicemail audio to you. With your voicemail messages channeled into the same place as your emails, your Ooma Real Estate phone system helps you stay organized. Plus, when the messages are audio clips, you can save them with your client files if needed. 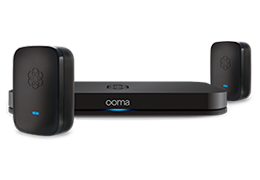 Additionally, Ooma offers a voice-to-text service. Whether you want the added convenience or time savings, reading the transcribed voicemail means you can avoid listening to messages altogether. Your real estate agents need strong communication tools to set appointments, follow up with clients, and field client inquiries about the local market. Many agents are forced to rely upon their personal cell phone to connect with clients because mobility is essential for the job. While a piecemeal phone solution of a main business number and personal cell phones can work in a pinch, it’s not an effective way to ensure there’s an open communication pathway between agents and clients. The Ooma Office free calling app can help your business balance accessibility and mobility. Agents can make or receive calls with the app as though they were on their desk phones. Moreover, by offering clients anytime access to agents, they can feel supported knowing their calls will get through and their questions answered. There’s a friction point when a potential buyer calls the agency’s business phone only to have to take down the agent’s cell number and place a secondary phone call. This multi-step procedure doesn’t exactly make a good first impression. Ooma Office’s app can solve this obstacle. When a client calls the business’ main line, he or she can be directly transferred to an agent’s line, which will ring both on the agent’s desk phone and on the mobile app. This streamlined solution reduces the risk that you’ll lose a client during the phone number pass-off. It’s beneficial for the agents also; no more juggling work calls on two phone numbers and two voicemails. Plus, because calls are made and received using the app, agents can have the privacy of not giving out their personal cell phone numbers. Fielding incoming calls can be a challenge in a busy agency, taking a significant amount of staff time and potentially risking missed leads because of human error. Ooma Office offers a high-tech alternative to managing incoming calls. Our virtual receptionist feature makes a professional first impression while also automating call answering, freeing up your staff to work on other things. Following a greeting, it can provide information such as hours or open house details. Callers can select the extension or department they’re seeking. Ooma has heard from countless businesses how the virtual receptionist feature has made a significant impact on their work life. Cape Coral Bookkeeping & Payroll commented about the feature saying that it was like adding an additional employee to its staff. Additionally, Ooma’s ring groups feature can help connect callers with agents. When a prospect calls the real estate office, all agent lines can ring simultaneously, and the first available agent can answer, thereby creating a better customer experience by limiting the number of times callers need to leave voice messages. Wondering if Ooma Office is right for you? 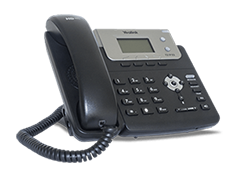 We’ll walk you through some of the key features to consider when choosing a business phone.